This year, for the first time in Lily's honor, my mom and I packed and donated a box to Samaritan's Purse for Operation Christmas Child. We have decided to make this an annual tradition. What I love about Samaritan's Purse is that they provide both physical and spiritual aid to suffering people worldwide in the Name of Jesus Christ. It is not a humanitarian effort, but is all done for the glory of God and for His Kingdom. It is because He first loved us. They want to share the love of Christ and the hope of the Gospel, which is why I think it's wonderful to support organizations such as this, rather than just any organization. 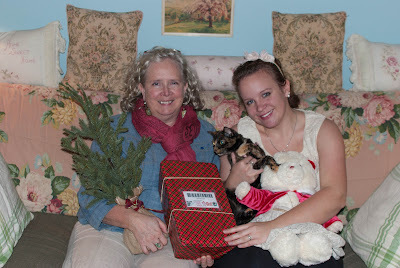 It is hard around Christmas not to have our daughter and granddaughter here to give beautiful gifts to, when we so long to. Doing this brings such joy to our hearts and gives us the opportunity to shop for a precious little girl around Lily's age. You can choose whether you want your box to be for a boy or girl and what age group. The youngest age is 2-4 and since Lily would be 2 this year, it's the perfect time to start this tradition. We want to donate a box each year to a girl who is the age Lily would be that year. We are able to give another precious child in need the things we would like to give to Lily. We still got the joy of shopping for things for a 2-year-old girl and we are so blessed knowing the box will be a blessing. 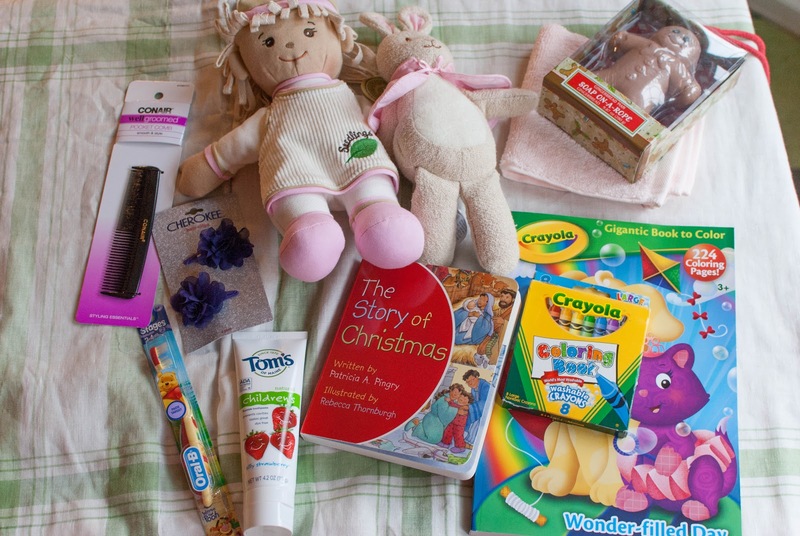 A little girl is going to have a very special Christmas box that she wouldn't be receiving if it weren't for Lily. The website gives a few recommendations as to what to add to the boxes, but really you can be quite free with it. We also chose to "Follow Our Box" and will hopefully be able to track by email to see where our box ends up. These are the things we included in the box: a doll, a bunny, a toothbrush and toothpaste, hair clips, a coloring book and crayons, a book about Jesus and what Christmas truly means, a washcloth and gingerbread soap, and a comb. We wanted to include both fun and practical things. We wrapped it up in lovely Christmas paper and prayed over it. Merry Christmas, Little One! Even though we don't know you, our Lord Jesus does. It is because of His love for you that we love you too! You are on our hearts and in our prayers. This is a gift given to you from our little sweetie named Lily, born March 16th, 2010. So Merry Christmas, little girl...whoever you are. From my girl to you. Here is Lily Bear with the box! The National Collection Week this year wrapped up on November 19th, to give enough time for the boxes to ship overseas so the children can have them for Christmas. But, I recommend everyone do this next year and all the years after that! 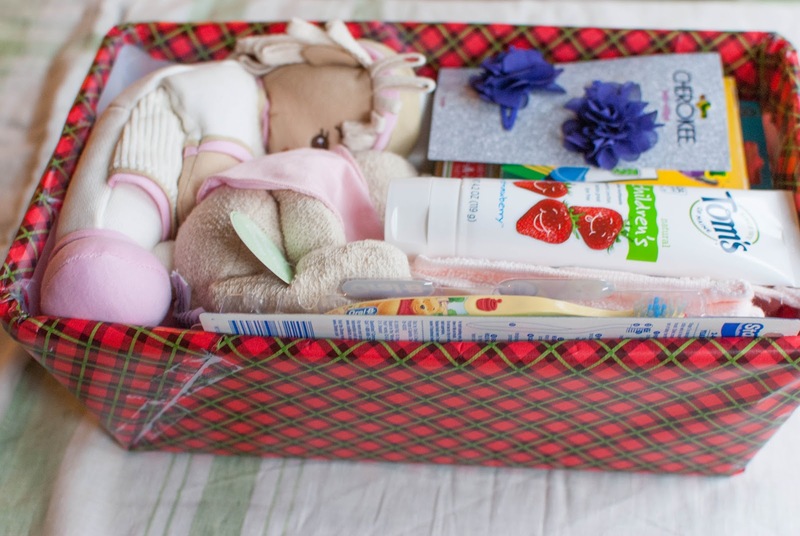 For those with babies in Heaven, you could even ask your family and friends to donate a box in your baby's honor as well. 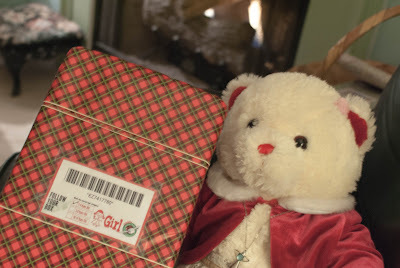 Since it's too late to put together a box now, for those who are interested, check out the Angel Tree Program, which is another way to help bring a beautiful Christmas to children in need. It is also a Christian based program. 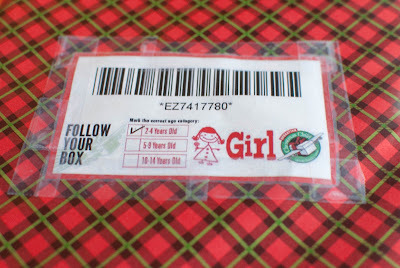 Lord, we ask that You would send this box to the little girl You have specifically picked out. You don't see the millions, You see each precious and individual life and You love this little girl beyond what we could ever comprehend. Please bless this little girl across the world from us. Draw her close to your heart. Use this box to show her a glimpse of the vast love You have for her. Thank You for using the legacy of our Lily in another beautiful way! Amen. I love it! That is such an amazing thing to do in honor of her! You are going to bless somebody on Christmas. :) You have a good heart. What an idea. We may do that this year with an angel tree. I would love to still get the chance to buy things for a 2 year old girl! Simply lovely, Lily is so proud of her Mommy.. So sad that I found out about this project too late to do it! But thanks for the idea, because I'm planning on making a box next year. I'm totally doing this next year! Absolutely love this! I have never heard of this organization before. So doing this next year!